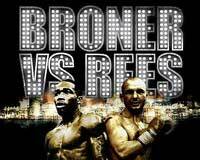 Review: 2013-02-16, Adrien Broner vs Gavin Rees gets three stars thanks to two knockdowns and two exciting rounds (4th and 5th). The undefeated Adrien Broner (25-0-0 with 21 victories coming by way of knockout) entered as the No.1 lightweight in the world while Gavin Rees (37-1-1) entered as the No.8. Broner vs Rees is valid for the WBC lightweight title (Broner’s first defense). Watch the video!